The Princes Arms Hotel was known as the Belle Vue Hotel in the era when a trip by paddle steamer from Conwy to Trefriw was one of the most popular outings for tourists in North Wales. The steamers used to tie up at a quay just over the road from the hotel. Victorian advertisements promised: “For the convenience of Passengers, Refreshments will be ready daily on arrival at The Belle Vue Hotel, Trefriw.” For 15 years the proprietor was Thomas Dutton, an art lover who covered almost every available area of wall with paintings. Some of the Conwy Valley’s talented artists had “inscribed some of their work either on the windows, door panels, or walls of the hotel”, according to a press report. Many of the paintings were by Buckley Ousey, who died aged 37 in 1889. Thomas Dutton also commissioned art from John Dawson Watson, as did his sister Sarah, who owned the Castle Hotel in Conwy. Thomas left Trefriw to run the Gogarth Abbey Hotel in Llandudno after the Belle Vue’s owners sold the hotel to a London-based syndicate in 1897. In 1909 the hotel was granted a summertime licence to serve refreshments at a new pavilion beside the quay to people who arrived in Trefriw by steamer, charabanc and motor car. Four steamers would bring up to 200 people each to the quay in high summer, and more than 100 would cross the road for refreshments in the Belle Vue – which interfered with the comfort of the hotel’s staying guests. Arguing the case for the licence, hotel manager Michael Judge said daytrippers “represented three classes, two of which he would not care to have at the hotel, although they were quite respectable”. 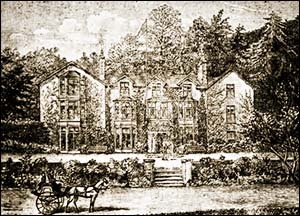 Trefriw’s population, normally 700, was about 1,500 in summer, when the hotel was so busy in summer that it had to put up guests in other buildings during the village’s croquet tournament.